It isn't that we're observing a dream, so much as seeing a play that takes place within a world that follows the same rules as dreams. 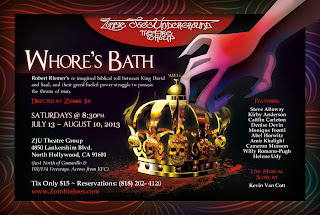 Towards that end, the second the house door opens at Zombie Joe's in North Hollywood, we are part of the play. In fact, before then! Because first we hear drumming. Not recorded, but live on the other side of that door. A beat that echoes and pounds and hints at something before us. When filing in, we see a cluster of persons on stage--dressed in rags, holding each other and running hands along their mutual bodies. Comfort? Foreplay? Dance? Maybe some combination of all three and more. But for now, they remain faceless, turned in amongst themselves. We are sucked into a new reality--and I for one found myself remembering how theatre began as religious ritual. Not a show with which to entertain, but a ritual with which we were to transform, learn and transcend. Kevin Van Cott plays those drums, and other instruments as the performance proceeds. He's listed as Master of the Sounds in the program. I won't tell you his one line, but it nicely breaks the fourth wall--or at least licks it. Whore's Bath never quite comes out and says it, but the Old Man (Amir Khalighi) at the center of the piece pretty clearly comes across as King Saul of ancient Israel. He has been deposed, and is sick as well as mad. Which came first is far from clear, deliberately so. His tormentor (Willy Romano-Pugh) openly insists others call him King David. The play makes much of the idea that David and Saul's son Jonathan (Abel Horwitz) being lovers, making a strange sort of love triangle. The only other specific characters are Bathsheba (Cameron Munson) and the Sea-Witch of Endor (Denise Devin). Story? Well, like a dream, the play has a story but making a huge amount of sense of it makes for a riddle as baffling as it proves compelling. Such seems the point to me. One tries to interpret a theatre of dreams much as one does dreams themselves. Here we find much about youth and age, the inherent unfairness of both. Plus a terrible symphony of how love and power interfere with one another. And betrayal. By life and death, by time and politics, by family and friends and even by God. Personally, I saw also something of a mystical journey, of the once great King Saul leaving behind--painfully--the baggage of mortal life. It seemed to me a play about how Death is not the enemy. It can be a friend. In the end, something welcome. Perhaps suffering exists for us as heat and water do for the iron to be forged into steel. Maybe. As Saul suffers pain and doubt, as he endures humiliation and madness with horrifying bouts of awareness, he clings to all the details of life. His memories. Pleasures of the moment and the past. Pride. Fear. His loves and what connection he can make with others, even when his delusions won't allow him to view many of the wretched humanity that surrounds him. All of this could frankly wreck itself on pretentiousness. People who go to a lot of theatre sooner or later see as much. Many times. It requires a company--and by that I include playwright and director--to dive into the subject matter and swim its length rather than allow themselves to be swept away. Such a company we see here. The ritual with which the performance starts, as the doors open, brings us into this world and the cast do not hold back. Yet they also show great skill. One thing I tend to harp on is many plays is technique. Few things bother me more than actors who haven't a clue about the craft of acting--the ones who shout instead of project, who do long speeches with lots of energy but little or no thought to what they say, who cannot master the different sytles of theater in which they are cast. Case in point--speaking forward towards the audience when the person to whom you're speaking is elsewhere. This can look ridiculous. Unless the actor really is speaking to that person, not simply pretending! This cast revealed some powerful acting chops and made Whore's Bath as fascinating, revolting and beautiful as the best of our sweetest nightmares. Impressive! Extremely so! I do feel compelled to point out Kalighi and Romano-Pugh as shining in particular. Some plays simply rest of specific characters' shoulders--Hamlet and Cyrano de Bergerac come most obviously to mind. This one depends on Saul and David--that is, if they indeed are Saul and David. The program lists them as Old Man and Young Man. Both men exhibit a great deal of power on stage, as is needed if they are to portray KINGS! Horwitz seems almost eclipsed by them, not because he isn't doing his job but because he's doing it so well! His Jonathan, although heir to the throne, clearly cannot match the presence and impact of David. Hence he ends up serving instead of wearing a crown. Devin meanwhile exhibits a great stage presence (honestly I've never seen her fail to command a stage upon which she sets foot) and Munson captures very well the kind of pretty, sexual glamor such a creature must have had in one way or another. Whore's Bath plays Saturdays at 8:30pm until August 10 (unless there is an extension, which I'd regard as good news for LA theatre-goers). You can make reservations at 818-202-4120 or at the door at Zombie Joe's Underground Theater 4850 Lankershim, North Hollywood (just south of the NoHo sign, across the street from KFC).